My father was godfather to a newly wed this weekend and my mother and I accompanied him. The wedding took place out of the city and that meant a long drive. I enjoy long drives. So when my parents asked me to tag along, I agreed. But the unexpected traffic going home ruined the drive for me though. Brown base color is 2 coats of Orly Hot Chocolate. I remember using this on my Nail Art: Dots On Dots. I absolutely love this brown color and application is a breeze. The bottle color is much lighter compared to when its applied to nails. It becomes a deep brown after 2 layers. The flowers were all hand painted using acrylic paint and a detailing nail art brush. Please forgive the lack of artistry. I really am clueless when it comes to posing for the camera. Perhaps I can do this on a regular basis, matching a nail design for an outfit just because I had fun and I think it is a great personal challenge. The color of the dress is sort of golden brown. I originally wanted to match that color with a nail polish, but unfortunately, I don't have one that matches that shade. I was torn between something yellow or beige as base color for my nails until I decided for a deep brown that would match my shoes. The idea is to come up with a nail design that would complement the outfit, and not just the dress. And since I am not really into accessories, I decided to use the colors on the look to create a nail art that would tie everything together. Personally, I think the chocolate color of the nail polish created continuity from top to bottom. It is a subtle contrast to the dress color. Further, I also painted the small flowers using the hues of the dress for coherence. Photo was taken inside the Church. In all my nail art designs, I have always strive to achieve clear lines. It has become a personal style. Mainly because I think they look neater that way. I find that it is easier to look at nail designs like that. 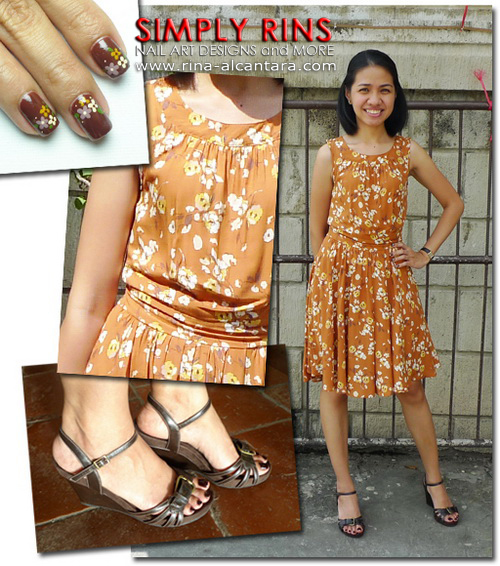 The reason I'm saying this is because at first, I wanted to paint the floral pattern on my dress into my nails. But that would mean I have to divert to my style. I chose not to because I think it is good to have a personal style. It is sort of your watermark. I alternated the placement of the flowers in each nail. I chose to paint the tiny flowers near the free edge and near the cuticle area. It makes it more interesting that way. If you are more into consistency, you may choose either. I would probably choose painting the flowers near the cuticle area if I had to choose only one place on my nails. How do you feel about this matching nail art? Thank you! I was really aiming for simplicity and elegance. I wasn't sure about the latter, so I really appreciate that you saw it that way. :) I'll see you soon for another night cap! Turuan mo akong mag emote sa harap ng cam please! I look pretty? Aw, thank you! You look lovely and manicure is beautiful as always! I think the chocolate brown was a good choice! lovely..u look soo sweet in tht dress! These are so perfect for the dress! I hope One day to be as inspirational in my nail designs as you are to me! Hi, Sha Does Shaweet Nails!! oooh the flowers are so cute!! !